1 Bed mattress was extremely worn out and was 1 sided but thankfully we had an extra bed. Otherwise it was awesome!! The shower in the top level bathroom cuts off periodically.. but most of all the cabin was great. Absolutely the cleanest cabin we have ever rented in the Gatlinburg area. We had a large family gathering with ages 2 weeks to 72 years and it was wonderful for everyone. In the past we have had to bring a lot of kitchen stuff with us but since we rented this one before and knew that it was very well stocked, we were able to lighten our load and leave lots of things at home. The kitchen knives could be sharper. We did bring extra dish towels just so we wouldn't have to wash them multiple times. We had a visitor (a racoon) who got into our trash but he provided entertainment for the kids and posed for pictures! The cabin was nicely furnished and fit our needs nicely. The only thing that I can add is that there were no kitchen towels in the facility and one of the video arcades was not working. Repairman arrived but was unable to repair it as it needed a new computer board. 2nd yr in a row at this cabin. Our family thoroughly loves being there and will book again for next year! Thanks for the Christmas decorations this year. That was appreciated!! I do request a ramp be built at the upper side for members of our family that struggle with steps and walking in general. Also, if the front steps could be power washed in the fall, it would be appreciated. It was a rainy weekend, and the steps were super slippery from the green stuff. We had 23 people and we had the best time. The kids love the game room and theater room. We loved the location and pool. We will be coming back soon! One of the most exquisite place I’ve ever stayed loved it would recommend to everyone in the near future. Cabin itself was great....very roomy - fit everyone perfectly. The game room, furniture, appliances were all awesome! kids loved it. Ran into a few minor issues (cable, wifi, dryer) but your staff was on the spot responding and addressing and resolving - very friendly people, extremely pleased. Easy check in check out procedures and communications. The only drawback - not that there is anything you can necessarily do about it - is that the neighborhood is a little disappointing - no green space to have a fire pit, play catch, no lawn to run around on with kids. The C'Mon Inn is surrounded by all asphalt roads and driveways. Loved! Loved! Loved it! By far the cleanest cabin we have stayed in. Our initial response on entering was “It’s beautiful and it’s very clean.” We bring 22 to Gatlinburg every January for a late family Christmas and keep changing cabins because we aren’t pleased for one reason or another. We will be back to C’Mon Inn next year! Beautifully appointed, spotless, kitchen very well equipped. Love that it was still decorated for Christmas. We had 5 under the age of 5 and were able to position them in bedrooms so that they did not disturb each other. We were concerned about parking but it really wasn’t a problem even though the space is shared between 2 cabins. We had 8 cars and parked them tightly. The cabin next door parked 3 cars in the lot with us and used the parking at their back door for 3 or 4 more. It worked fine. Even though it was frigid outside, we were toasty warm in all areas of the cabin. Everyone agreed that it is the best place we have found! Overall this was an amazing vacation and cabin, the location is amazing, so close to everything. We stayed here 12/9/17 - 12/17/17 with 18 people, plenty of room and very comfortable accommodations. The cabin overall was very comfortable and well equipped. My husband is a chef and he was able to find everything he needed in the kitchen. Gameroom was great fun for the kids, and movie room had a great selection of DVDs. There were a few small issues with the Cabin, but we called CabinsUSA and within 30 minutes someone was out to fix everything, absolutely amazing service. Would definitely rent this cabin and through cabinsUSA in the future. Cons about the cabin: the WiFi is really poor, we could hardly stream Pandora it was so slow, but there was so much else do do at the cabin it hardly mattered. Parking is very tight. It shares a parking lot with another 20 person cabin. We had 5 cars and when all the people showed up for the cabin next door we had to play a round of musical cars to get everyone to fit. We all fit, just tight.. but what a fun way to get to know your neighbors with a round of Tetris, car edition. The cabin was fantastic! Great location, parking, magnificent kitchen and decorated wonderfully. Our family had a fantastic time. I would like to see a handicapped ramp built on the side this summer for easy access to those that have difficulty with steps. We will be returning to this cabin next year. Biggest concerns, several smoke detectors in the cabin didn’t work (my brother in law is a firefighter and checked them). Thank you for taking the time to let us know about your recent stay in C'mon Inn! We here at Cabins USA work hard to make sure each of our guests have the same great stay you enjoyed while vacationing in the Smokies. Thank you for letting us know about the smoke detectors. Your comments will be forwarded to our maintenance department to be addressed. When you are ready to stay with us again, please mention you are a return guest for an additional discount. Thank you again for your review and thank you for choosing Cabins USA! Our group of 12 Senior age ladies enjoyed this cabin immensely. If 12 women can’t find anything negative to say about something, then you know it was pretty good. We had plenty of room and didn’t feel like we were on top of each other all the time. Out favorite rooms were the dining room and the beautiful kitchen. Oh we all wanted to have a kitchen like that! The location was perfect, the driveway was a little hard to see at night, but other wise, perfect location. The beds were all comfortable and bathrooms were beautiful. This was our first time as a group to take a trip together and we were very much satisfied with our cabin. To the owners thank you for having such a beautiful cabin to share. The girls that I spoke with at Cabins USA, they could not have been nicer. We had a wonderful time and hope to return soon. We rented this cabin to celebrate our 50th wedding anniversary with most of our children and grandchildren. We had a total of 21 guests. The accommodations were great as well as the location. We did have a few problems with fireplace and hot water. As a long time homeowner I realize that things sometimes wear out. When we reported them the maintenance people were "johnny on the spot". They were very friendly even when they had to replace a heating element on water heater, which is a big job. They were able to repair it without any inconvenience to us. They we very respectful and apologetic for any of our problems. They never left without asking us if there was anything else they could help us with. I would give this cabin and CABINS USA an "A" . We had a great time and will definitely choose CABINS USA when we decide to rent another cabin. Thank you guys for making our anniversary a time we will cherish. Awesome visit!!! We were celebrating my grandson's 13th birthday along with 15 of his friends and they had a blast!!! Everything was perfect and the boys did not want to leave!!!! We will certainly come back lots of times!!! No complains at all!! Great times!!! I am so happy to hear that everyone enjoyed their stay in C'Mon Inn! We here at Cabins USA strive to give each of our guests the best stay possible while vacationing in the Smokies. When you are ready to stay with us again, please mention you are a return guest for an additional discount. Thank you again for your review and thank you for choosing Cabins USA! My only complaint would be garbage cans need to be emptied daily. We had no room to put more so lids stayed open, so raccoons were getting into trash. We were very satisfied with the cabin, we found it to be very clean and comfortable! The kitchen was our favorite meeting place for all 3 families. Very roomy and inviting. We soon were talking about how we wished we'd reserved for more than 3 days. Only a couple things to mention...when we checked in, we were given armbands for the pool. On my way out I read that we would be charged for bands not returned. We had 16 registered guests and 12 armbands. I went back into the office as there was no count recorded. One of your clerks, (not the one who registered us) was helpful and recorded the number of bands on the clipboard. I wonder if we would have been charged for 4 bands we didn't recieve if I had not gone back into the office. When we got to the cabin and checked for working TV's etc, we could not figure out how to work one of the video games. I called and left a message with the office, giving my phone number as requested for a return phone call. We never got called back on our request. We never did get the video machine to work. We still talk about what a nice time we had. Even with those few concerns (which were minor overall) it was a wonderful weekend. We will be using Cabins USA to book our next visit. Great cabin. Smoke alarms went off first night at 2:30 AM. Had fire dept. and police come.Tvs did not work very Well.But otherwise had a great stay.Suggest a 24 hour emergency number. We had a great time. We booked this cabin for a church getaway and could not have asked for a more perfect cabin. My only complaint is the parking. We only had 13 people and only 5 vehicles. The parking is shared with the next door cabin and thankfully they only had a few cars. If we would have had the full amount of people that the cabin sleeps, we would have had more cars and would not have fit in the parking area. The grill didn't work and couldn't be fixed but that was the cabin owners fault not cabins USA. The cabin is gorgeous, and so spacious. Perfect cabin and couldn't have asked for more! Thank you for taking the time to let us know about your recent stay in C'Mon Inn! We here at Cabins USA work hard to make sure each of our guests have the best stay possible while vacationing in the Smokies. I apologize for the issues you experienced with grill. Your comments have been forwarded to our maintenance department to be addressed. When you are ready to stay with us again, please mention you are a return guest for an additional discount. Thank you for choosing Cabins USA and we look forward to seeing you again soon! The cabin was great. Big enough for a lot of people. Parking our 6 cars was not an issue for us as I had seen in previous reviews it was for others. Everything was clean. Even the hot tub looked really clean. Very close to all the shops and attractions. Only complaint we really had was the gas grills and the online chat. We had to get on the chat to find out the wifi code. For some reason they wouldn't answer, or transfer the question. It took a couple of times of getting online to get someone to answer. The grills were out of gas. We went and got gas for it only to find out only one burner worked. All in all it was a great place to stay and would definitely recommend. This is a beautiful Cabin. Our entire family enjoyed our stay! I am so happy to hear that you enjoyed your stay in C'Mon Inn! When you are ready to stay with us again, please mention you are a return guest for an additional discount. Thank you again for your review and thank you for choosing Cabins USA! We stayed in C'mon Inn for 4 nights with 17 people. The cabin was very nice and spacious. We never felt like we didn't have enough room. The decor in the cabin was really neat with each room having a different theme. The cabin is very well supplied in the kitchen, with linens and with plenty of options for entertainment. The only minor inconvenience we had was with the amount of parking available that had to be shared with another cabin. Overall, we had a great time and would definitely consider this cabin again if returning to the area and would recommend it to friends. We loved this cabin! Our only suggestion is be sure you get the code for the security alarm! It wasn't included in our check in information and the alarm went off when we entered the cabin. I was impressed with how quickly the emergency maintenance number responded on Christmas Day and was able to give us the code. We had to call the next day for the wifi password also. I hate to sound like a complainer but don't want anyone else to have the same problem. We really were very pleased with this cabin and would definitely rent it again. Oh, it was a little bit hard to find also. But, seriously, we loved it. Ha. Thank you for taking the time to let us know about your recent stay in C'Mon Inn! We here at Cabins USA work hard to make sure each of our guests have the best stay possible while vacationing in the Smokies. I apologize for the issues you experienced with the with the alarm. Your comments have been forwarded to management to be addressed. When you are ready to stay with us again, please mention you are a return guest for an additional discount. Thank you again for your review and thank you for choosing Cabins USA! The cabin was more than we could have asked for. This was our family Christmas gathering and it was very spacious and had the comfort of home. Definetly recommend this cabin. Also the staff at cabins Usa was friendly and very helpful. We will be back. Beautiful cabin. Updated kitchen and numerous amenities. Gave an "8" for cleanliness because we found someone's socks in the bedding in one of the bedrooms. Other than that, it was a great cabin for our family! Thank you for all of your kind words! We here at Cabins USA work hard to make sure each of our guests have the same great stay you enjoyed while vacationing in the Smokies. I apologize for the cleanliness issues you experienced during your stay. Your comments have been forwarded to our housekeeping supervisor to ensure this is corrected. When you are ready to stay with us again, please mention you are a return guest for an additional discount. Thank you again for your review and thank you for choosing Cabins USA! Beautiful cabin. Large, clean and comfortable. Unfortunately, a few things could have been addressed before we got there. For example the hot-tub wasn't functioning when we arrived, we weren't provided with a alarm code for check-in which caused us to set off the alarm, there was a broken chair in the dining room, etc. However, when we called to address these issues, the staff were extremely helpful and accommodating and sent help straight away. The location is good enough. 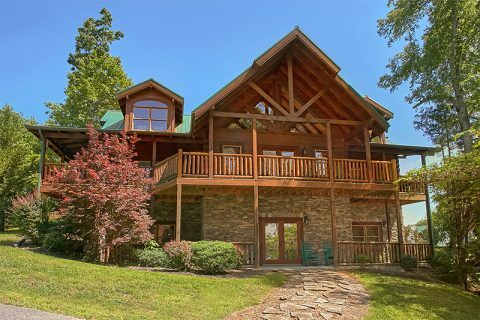 Only a couple of minute drive from the main street of Pigeon Forge, you aren't very far away from people or the town, so if you're looking for a reclusive retreat, this is not for you. Very close to Gatlinberg and great hiking in the Smokies, and for a good deal. Overall, would recommend Cabins USA and specifically the C'Monn Inn! Thank you for taking the time to let us know about your recent stay in C'Mon Inn! We here at Cabins USA work hard to make sure each of our guests have the best stay possible while vacationing in the Smokies. I apologize for the issues you experienced during your stay, but I am happy to hear our maintenance department was able to address those for you. When you are ready to stay with us again, please mention you are a return guest for an additional discount. Thank you again for your review and thank you for choosing Cabins USA! Thank you for taking the time to let us know about your recent stay in C'Mon Inn! We here at Cabins USA work hard to make sure each of our guests have the same great stay you enjoyed while vacationing in the Smokies. I apologize for the issues you experienced with the hot tub during your stay. Your comments have been forwarded to our maintenance department to be addressed. When you are ready to stay with us again, please mention you are return guest for an additional discount. Thank you again for your review and thank you for choosing Cabins USA!